Take a bunch of artists from all different schools of music — country, blues, indie rock, gospel, folk and that strange place in music that can only be occupied by Tom Waits — and set them to covering some classic New Orleans songs, backed by the Preservation Hall Jazz Band, and what do you have? 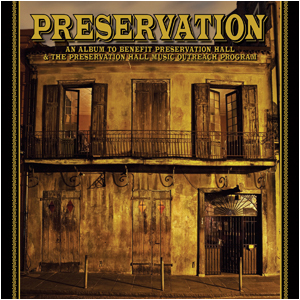 A phenomonal sounding record with all proceeds going to benefit Preservation Hall and its music outreach program. Preservation Hall has been operating since 1961 in New Orleans’ French Quarter, showcasing traditional New Orleans jazz. The building has no running water or electricity, no food or drinks are served, and seating is minimal at best. But none of that matters, as Preservation Hall has one focus only: the music. Each of the artists involved in the project traveled to Preservation Hall itself to record new takes on old classsics. The album comes out on Tuesday, February 16 as a standard CD, deluxe edition double CD, and a double LP. While you’re waiting to pick up your copy, you can stream the album online at Stache Media or using the tiny little controls at the top of the album’s website. i am loving this album, cory chisel is my favorite. i’ll be seeing him in columbus on wednesday and i can’t wait! Wow…I haven’t heard Andrew Bird sounding like that in a long time. Cool album.